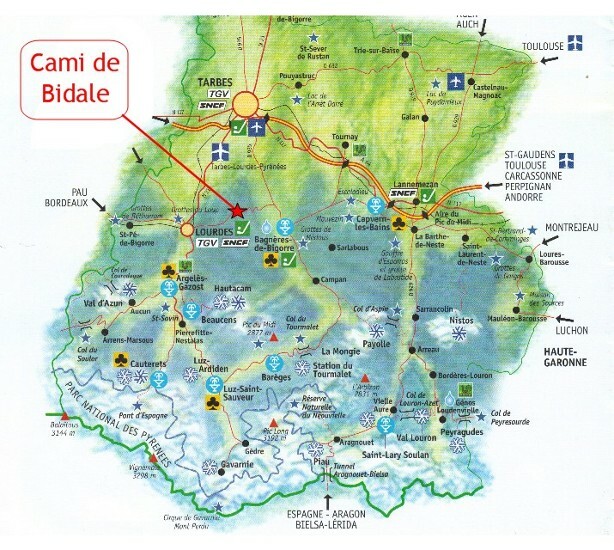 Cami de Bidale is located in the foothills of the Pyrenees, in South West France. This is the heart of the Hautes-Pyrénées, among the famous cycling Cols, spa towns and ski resorts. Zoom on the map (right) for detail. To find us, please download our directions from Toulouse, Pau or Lourdes airport or use the Google Map functions below. For SatNav, select 'Garobit' directly or GPS coordinates 43.11621, 0.051413. For Transport options to the region see Getting Here below.